All Kalm Pilates programmes are focused on delivering results. The secret? No fads, just a combination of powerful and effective exercise, working out with the correct technique and doing short, regular workouts. Most importantly, it is completely doable, even if you don’t tend to exercise regularly. Pilates works so well for fixing or reducing back issues, because it restores the muscle balance in the body. It tackles the main causes of back pain – a lack of core strength, tight muscles that pull on the spine and incorrect posture. Each week, you will find 3 x 30 min videos on your personal page on the website. If you miss a class, don’t worry – you will have LIFETIME ACCESS to your account. It means the classes stay on your page and you can always catch up in your own time, but we advise to stick with the schedule to help you improve your back issues within 12 weeks. Just roll out your mat every other day at a time that is convenient for you and follow the short workout. If you have a serious back issue and you are not sure if you can start Pilates, we advise to check with your health care professional (ask your GP or Physio). Each month, you get a combination of new and repeat classes to create a challenging workout schedule that is focused on helping you to improve and get a step closer to achieving your goals. Once you have signed up, you will have access to your own personal page where you can find your weekly videos. All you have to do then is to roll out your mat, press play and enjoy the class. Expect it to be challenging, but in a good way! It truly delivers great results – check out the testimonials of some of our current members here. If you have completed the programme and are not happy with the results, we will give you your Money Back. We are pretty confident you will love it, but just know that we are more than happy to offer a refund if the programme doesn’t meet your expectations. 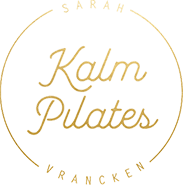 “I came across Kalm Pilates on Instagram and I’m in my final block of classes from the Get To The Core programme. This is the perfect programme to REALLY tone up your body as Pilates works the muscles in isolation and with great control, which is the most effective way of sculpting the body. And no cardio required – no running, burpees or jumping jacks – instead, you will be taught the most effective exercises to target the main areas of your body: abs, bum, legs, shoulders and arms. We are so confident about the power of our Pilates method that we will give you your money back if you don’t see or feel any difference after completing this programme. Each week, you will find 3 x 30 min workout videos on your personal page on the website. If you miss a class, don’t worry as you have LIFETIME ACCESS to your programme – the classes stay on your page and you can always catch up in your own time, but we advise to stick with the schedule to help you achieve your goals in 12 weeks.